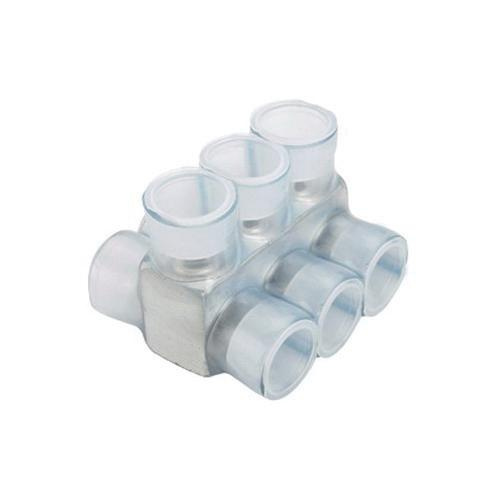 Panduit Type PCSB 6-Port insulated multi-tap connector is suitable for use with aluminum or copper conductors. Connector of hex size 5/16-Inch, has double sided cable entry. It accommodates stranded conductor of size 250-MCM - 10-AWG. Connector features high-strength, extruded aluminum alloy construction to provide premium electrical and mechanical performance. It has clear PVC insulation that eliminates the need for taping and allows for visual inspection of the complete conductor insertion. It withstands voltage rating of 600-Volts. Connector measures 5.78-Inch x 2.63-Inch x 2.13-Inch. Plated steel or aluminum set screw offers high-strength electrical contact between conductor and connector. It withstands temperature rating of 90 deg C. Connector is UL listed, CSA certified and RoHS compliant.